Skorpios (Greek: ��������) is a private island in the Ionian Sea off the western coast of Greece and just to the east of the island of Lefkada. The 2001 census reported a population of two inhabitants. Administratively it is part of the municipality of Meganisi in Lefkada Prefecture. 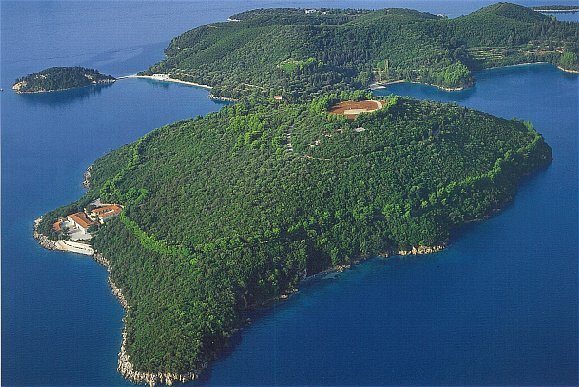 It is mainly known as the private island of the late Greek shipping billionaire Aristotle Onassis. It was the site of his wedding to former US First Lady Jacqueline Kennedy on October 20, 1968. Upon his death it passed to his daughter Christina, and then in turn to her daughter Athina Roussel. Onassis, his son Alexander, and his daughter Christina are all buried on the island.